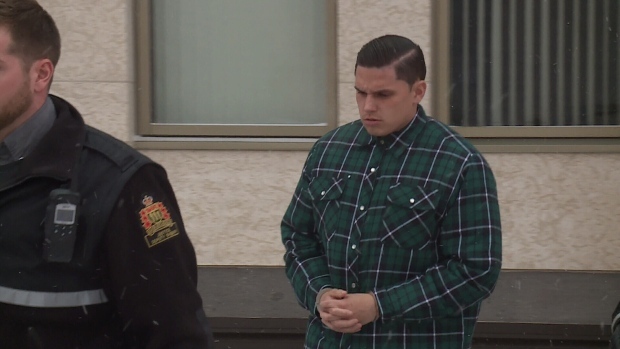 Duran Redwood, found guilty of second degree murder in relation to his girlfriend's death, leaves Court of Queen's Bench in Regina on January 16th, 2019. The sentencing of a Regina man found guilty of second degree murder has been moved to March. A jury found Duran Redwood guilty of murder in the death of his girlfriend, Celeste Yawney on Feb. 1. Yawney was found dead in her home in May 2015 after an altercation with Redwood, and died of blunt force trauma to the head and abdomen. Redwood’s defence said they were still canvassing options on how to approach sentencing. Sentencing was expected to proceed Thursday but was adjourned to March 25.